Reflecting on evaluation practice by considering an educative values-engaged approach: How would it have changed this utilisation-focused evaluation? 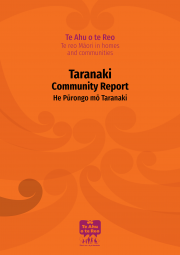 Tuatahi, mā ngā tāngata o Taranaki tēnei pūrongo, ā, e whakaata ana i ngā kōrero i tukuna mai e ngā whānau me ngā pou reo (ngā kaiārahi, ngā kaihāpai i te reo Māori i te hapori) mō te ora o te reo Māori i roto i te hapori me tōna hiranga ki ngā whānau o Taranaki. I Taranaki, i ārahina te rangahau e Hinerangi Edwards rāua ko Kiwa Hammond. He mea tuhi nā Nicola Bright, Maraea Hunia, Basil Keane me Lynne Harata Te Aika me Rachel Felgate, Cathy Wylie. 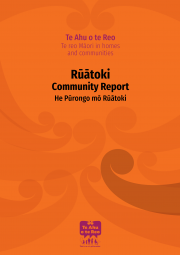 Tuatahi, mā ngā tāngata o Ōtautahi tēnei pūrongo, ā, e whakaata ana i ngā kōrero i tukuna mai e ngā whānau me ngā pou reo (ngā kaiārahi, ngā kaihāpai i te reo Māori i te hapori) mō te ora o te reo Māori I roto i te hapori me tōna hiranga ki ngā whānau o Ōtautahi. I Ōtautahi, i ārahina te rangahau e Lynne Harata Te Aika. 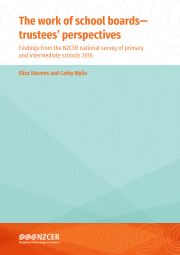 This report looks at trustees responses to a questionnaire about effective governance, as described by the Education Review Office. 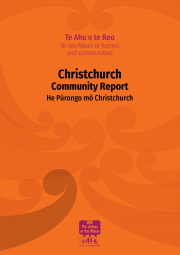 The report draws on data from the NZCER National Survey of Primary and Intermediate Schools, which was conducted in late August and early September 2016. We sent questionnaires via school principals to board chairs and trustees. The response rate was 25% (n=176), with 61% of those responses from board chairs. 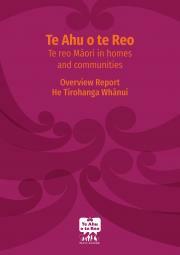 He mea tuhi nā Jessica Hutchings, Rawinia Higgins, Nicola Bright, Basil Keane, Vini Olsen-Reeder, Maraea Hunia, me Jenny Lee-Morgan rāua ko Eruera Morgan, Jen Martin rāua ko Stephanie Fong, Waitiahoaho Emery, Titoki Black, Hinerangi Edwards rāua ko Kiwa Hammond, Lynne Harata Te Aika, me Cathy Wylie, Rachel Felgate, Rachael Kearns. I te tuatahi, ko te rīpoata Hapori hoki o Rūātoki mā ngā tāngata ake o Rūātoki. Ka whakaata ake tēnā i ngā kōrero mai a ngā whānau me ngā pou reo mō te hauora o te reo Māori ki roto i te whārua, me ōna hua ki ngā whānau o Rūātoki. I Rūātoki, he mea ārahi te rangahau e Tītoki Black rātou ko Irene Huka Williams ko Te Whetū McCorkindale. 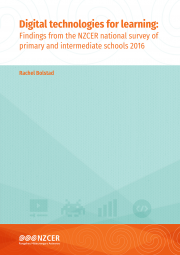 This report looks at the role of digital technologies for learning in primary and intermediate schools. The report draws on data from the NZCER National Survey of Primary and Intermediate Schools, which was conducted in late August and early September 2016. The survey asked how digital technology is being used, how it could be used, and what it means for teaching and learning. 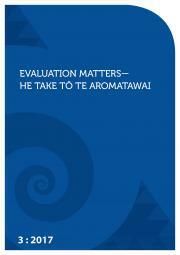 The survey sought the views of principals, teachers, trustees, parents and whānau. 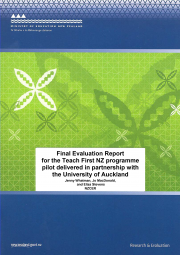 This is the final evaluation report of the Teach First NZ programme pilot, delivered in partnership with The University of Auckland. The Teach First NZ pilot programme is an alternative field-based Initial Teacher Education (ITE) two-year programme. The pilot programme operated between 2013 and 2016 with three annual intakes of up to 20 participants. You can find the report on the Education Counts website. As a learning model, apprenticeship is well known for its capacity to develop skills and vocational identities. It is also increasingly appealing for its potential to develop soft skills and enhance dispositions. This article focuses on the nature and role of apprenticeship and employers in developing dispositions and soft skills. It draws on a two-year New Zealand study of 41 apprentices in general practice medicine, carpentry, and engineering technician work, and their workplace mentors and teachers. This project focuses on capability-building through a new apprenticeship for support workers.